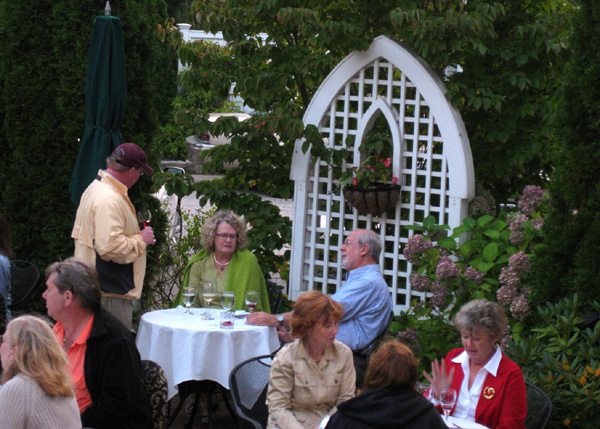 In my search for wonderful wines to serve guest at our Cape Cod Bed and Breakfast, I attended a great wine tasting hosted by Cellar 55 Wine Merchants on the patio at the Belfry Bistro in Sandwich. It was a perfect night outside, but you could tell the seasons are changing and we need to enjoy these waning summer-like nights of outdoor wine tastings. The tasting was all about Pinot Noir. David, from Cellar 55, has called me a true “Pinot Hound”: someone who really loves Pinot Noir. This was definitely a night for the hounds. The four Pinot Noir wines offered expressed the breath and depth of this grape. I just love wine and wine tastings because it never ceases to amaze me that such different and distinctive tastes and flavors can all come from the same grape variety. Pinot Noir is the signature red grape for wines produced in the Burgundy region of France and is one of the classic varieties used in Champagne. It is a thin-skinned grape, which can be hard to grow and harvest, but in the right place it can produce magnificent wines. That recent cult movie, Sideways, may have impacted the general public’s and the typical consumer’s impressions of Pinot Noir, but the grape and its wine have been a main stay of the wine world for hundreds of years. Spenser, from Horizon Beverage Company, guided us on a wonderful tour of some very interesting and different Pinot Noirs. Our first wine was a classic French representation, the 2007 Louis Jadot Pinot Noir. In a nod to the American market, this French wine is actually labeled as a Pinot Noir instead of the traditional Burgundy. The infamous first growth French red Burgundies often command release prices in the $300-$500 per bottle range. The Louis Jadot family is an nègociant with 150-years of experience of sourcing and creating excellent offerings of French burgundy at affordable prices. Our second stop on the Pinot Noir tour took us to Sonoma, CA. 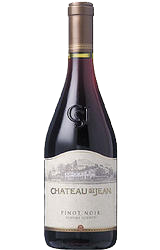 The 2007 Chateau St Jean Pinot Noir is a fine example of this regions treatment of this grape. Different form the French, but delightful in its own way. The next two wines were both from Oregon, the 2008 King Estate Pinot Noir and the 2008 Lange Three Hills Cuvee Pinot Noir. Both Oregon wines are made with grapes from the Willamette Valley AVA (Approved Viticultural Areas). The Willamette Valley shares climate and terroir characteristics with some of the best know growing areas of Burgundy and is having similar success with it Point Noirs. It’s never too early to look for that perfect Pinot Noir to serve with Thanksgiving dinner. At this moment, I would be leaning towards the Chateau St Jean, a lighter and fruiter wine to complement that turkey and all the trimmings. But I still have time to taste more wines before I make that final choice, and trust me, I’ll taste as many more as I can.